your hearing matters to those around you! come in for a hearing evaluation we are here to help. and make the most of your time together. Our office is conveniently located in the heart of Roseville on Sunrise Avenue, next to the Old Spaghetti Factory. Walk ins are welcome. Please come visit us today. We offer a full-range of hearing services. Whether you need hearing protection or are experiencing a hearing loss we can provide you with the services you need. 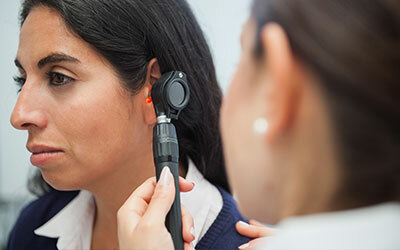 Hearing tests help determine what kind of hearing loss you have by measuring your ability to hear sounds. Find out more about your hearing health. At Community Hearing Aid Center, we help people hear better. We truly enjoy watching our customer's lives improve as we work to enhance their understanding of speech and the sounds around them through the use of sound design and amplification. The certified, Hearing Specialist at Community Hearing Aid Center is ready to give your hearing the attention it deserves. Our history with Ed and Gail Vinson began 20 years ago, when Linda’s mother needed hearing aids. Their professional care and kind/tender treatment of her during those years made it an easy choice for both of us. When we realized that we needed hearing aids for ourselves, it made it an easy choice for us to continue with them and one we have never regretted. We are so pleased to recommend the care and expert treatment provided by Ed Vinson and his equally efficient/caring office manager, Gail Vinson. I am a previous patient of Ed and Gail Vinson. About 5 years ago, I was referred to them to get my first hearing aid and I had every emotion you could possibly imagine. However, they were warm, friendly and incredibly caring. They often go above and beyond. For example, one Halloween, I was in the Bay area and my hearing aid had a problem. It was a Saturday and a holiday weekend but Ed promptly called me back and did everything in his power to help me. I am so thankful to them both. I have been a client of Ed (and Gail) Vinson for over 16 years, along with 4 other of my family members. Take it from me, you will never find a more personal, experienced flexible and patient hearing aid dispenser ever! It’s amazing how Ed always knows what we need and he treats you like family! Needing and wearing hearing aids for years, I was so thankful when I found Ed Vinson. So much so, I have taken many new clients to him, knowing that they would be satisfied. I heartily recommend Ed Vinson. When I realized that my hearing was changing and that I probably needed a hearing aid, it was difficult for me. Ed helped me realize that life would be easier for me and all those around me when wearing a hearing aid. With years of experience, Ed is a very caring and knowledgeable person who takes the time to listen to your concerns and helps you become comfortable with your hearing aids. I am so glad that I found him! Our state-of-the-art hearing aids are bluetooth enabled incorporating the newest technology. We offer the most competitive price available and offer trade in rewards to returning customers. All hearing aids come with a two to three year warranty, insurance and batteries. At Community Hearing Aid Center, we value community and connection and are committed to creating an atmosphere of kindness and service. We don't use scripted answers to a client's questions and believe that an open dialogue between dispenser and client will produce the best possible results.